Rear cover means back cover. That's where the 5MP camera location take place. To open the back cover casing you can insert your fingernail into the opening gap located on the bottom side of the phone (from rear panel point a view, see the image below). Insert, lift the cover up until the cover is partly removed (you might hear a sound in this process), then continue on removing / opening the all sides of the cover until it's fully removed. There are two possible reasons why you should need to remove the back cover casing of Galaxy Ace: To insert / remove the SIM card and to assemble / remove the battery. In order to be able to insert the SIM card, you had to make sure that the battery doesn't assemble. With gold-contacts of the SIM card facing downward and cut-edge is align face to face with the "mouth" of the SIM card slot, slide and push the SIM card to its slot until it perfectly inserted in the slot. There no need additional steps. If you own the Galaxy Ace GT S5830 as a brand new phone, you must know that the battery was not assembled on its compartment. To assemble the battery align the metal-connector of the battery and the compartment with the SAMSUNG logo facing upward, then slide and press the battery until it go inside the compartment. The next steps is inserting the microSD to its memory card slot. 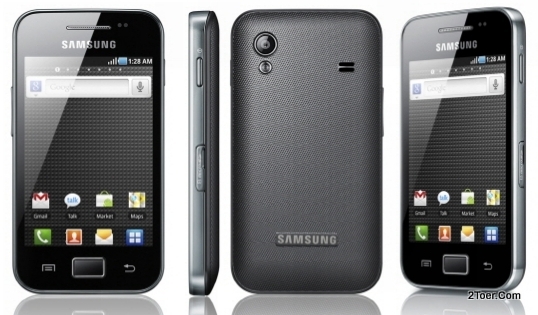 The galaxy ace includes 2GB microSD card slot. Open the memory card slot cover with your finger nail (detach it; the slot available on the left side of the phone from front panel view), then with gold-contacts of the microSD facing downward, insert and push the card with your fingernail until it locks (if the card didn't pop out, that means the card successfully locks). Close the cover back and done. To remove the microSD card from its slot: Open cover slot > Push to make the memory card eject (unlocked) > Pull the card out > close the cover. Just remember that you must unmount it first ( Settings > SD card and phone storage > Unmout SD card > OK) before you can safely remove the microSD from the slot. Home > applications > Settings > Privacy > Factory data reset > reset phone > Erase everything. Remember to backup your contacts, your personal data, and your google account before performing Master Reset.